A few kilometres upstream from Idar-Oberstein the Siesbach, coming from the Hochwald heights, flows into the Nahe river. In former times this quite insignificant stream formed the border between the Roman provinces Gallia Belgica and Germania Superior, and later between the jurisdictions of the archbishoprics of Trier and Mainz. During the years 1976/1977 a large Gallic-Roman burial mound was completely excavated at the headwaters of Siesbach in the forest-region "Kipp" at the foot of Hochwald. From its grave decorations and inventory from the grave the influence of the Roman culture on the native people of the Celtic Treverians can be impressively documented. This archaeological memorial, which possesses more than just local significance, was used as family burial ground between 167 and 174 AD by a distinguished and evidently wealthy Treverian family for three interment ceremonies and was completed around the year 175 AD. 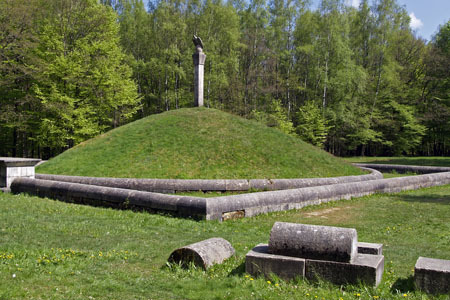 For an overview of the Celtic and Roman history an excursion to the museum in nearby Birkenfeld. is certainly worthwhile. A visit to the Gallic-Roman burial mounds near the town of Siesbach can be easily combined with a hike around the Idar-Oberstein region: follow Idarbach creek past the water mill "Weiherschleife" (with its water-driven tools for grinding and polishing agates), to the "peace oak", from there walk to Hettenrodt and then past Siesbach to the small forest road "Struthchaussee" at the foot of Ringskopf mountain. For those who prefer to travel in comfort, you can tour this area by car on a small road that begins in the town of Kirschweiler and passes the golf course below Kirschweiler Fortress.